Urbana: University of Illinois Press, 1988. Songprints, the first book-length exploration of the musical lives of Native American women, describes a century of cultural change and constancy among the Shoshone of Wyoming’s Wind River Reservation. Through my conversations with Emily, Angelina, Alberta, Helene, and Lenore, I try to capture the distinct personalities and perspectives of five generations of Shoshone women as they tell their thoughts, feelings, and attitudes toward their music. These women, who range in age from seventy to twenty, provide a unique historical perspective on many aspects of twentieth-century Wind River Shoshone life. In addition to documenting these oral histories, I transcribe and analyze seventy-five songs that the women sing—a microcosm of Northern Plains Indian music. 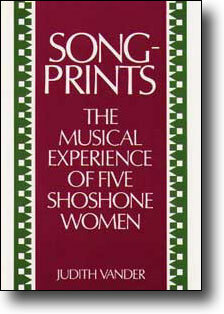 I show how each woman possesses her own songprint—a song repertoire distinctive to her culture, age, and personality, as unique in its configuartion as a fingerprint or footprint. The introduction to Songprints is available online at Google Print. If you would like to read it click here. A cassette tape, which includes 26 songs sung by the women (and, which are transcribed in the book), is available for purchase as a complement to the book.